Shape magazine has a Pilates workout that doesn’t require a bunch of exercise toys to complete. It’s a strength training workout that you can incorporate into your schedule. You don’t need a membership at a gym or any weights. This workout is based on The Pilates Promise by Alycea Ungaro. There are five moves that strengthen your core muscles that you master first, then you move on to strengthening your upper or lower body with different moves. All of the exercises are shown in detail with pictures on the website. She was angry. The health insurance wouldnâ€™t pay for a gastric bypass surgery for her. I was standing on the other side of her desk with no health insurance benefits and unable to find a company that would insure my husband and me for less than $700 a month and she was complaining because hers wouldnâ€™t cover gastric bypass surgery. I just wanted something that would pay for my husbandâ€™s expensive asthma medication that kept him alive and she was considering the same surgery that almost killed her brother. You can eat no more than 2 ounces of anything at a time. After you eat, you must wait two hours before you can eat again. Liquids count in that 2 ounce figure. If you eat more than 2 ounces in a sitting, a big man with a bad attitude will pummel you in the stomach for at least thirty minutes, and maybe as long as an hour. Or at least that’s how it will feel. Some foods will make you sick. You donâ€™t get to choose. It might be your favorite food on earth, but you wonâ€™t be able to eat it anymore… for the rest of your life. Sometimes you will get heart palpitations (called â€œdumpingâ€), even if you only eat one bite of food. You donâ€™t get to control when this happens. Speaking of bites of food, youâ€™ll have to cut your food up into miniscule pieces. Just get used to it. If you swallow anything bigger, you end up â€œdumpingâ€ or that big guy will come punch you in the stomach for a few hours. Think you can follow that diet? You havenâ€™t seen the huge guy I hired to make sure you follow it. And thatâ€™s only if you survive the surgery (1 out of 200 die within 30 days of the surgery). Maybe youâ€™ll never get those side effects, but there is no guarantee. Itâ€™s a crap shoot with your health. Even worse, you might survive the surgery and be able to live through the diet, but you never dealt with the issues that made you fat in the first place, so youâ€™ll be one of the lucky 15 percent of people who gain all the weight back and more. Snopes.com, the best urban legend debunking website around, has an article about an email piece that has been hitting the inboxes of people across the United States. The email in question states that you will no longer be allowed to buy vitamins over the counter if you do not act immediately. The article does a good job explaining why the email is invalid and give a clear and concise explanation of the issues regarding dietary supplements. Be that as it may, I really enjoyed looking at this list. There are tons of ideas for different kinds of exercise. Remember that your local library probably has some of these books and video titles available for you to borrow and try out (and if they don’t, Netflix definitely does). Even when I know why the scale is higher, I find it extremely hard to stay motivated. I wonder how it would be for people who don’t understand the physics of losing weight. Here is some important information that can affect your relationship with the scale. Use the same scale each time you weigh yourself. No scale is perfectly adjusted and each will read a little differently. Weigh at the same time every day. Youâ€™ll weigh the least in the morning after you have used the bathroom. Wear the same clothing every time you weigh. The idea that your clothes might account for that extra pound will go away when you wear the same clothes every time. Weigh yourself on the same day each week. That means only weigh yourself once a week. There are daily fluctuations in your body, but a week is long enough to see progress (or lack of it). It may have been extra salt in your diet. A high sodium intake can make your body retain water. If you have just started a workout regime or just increased the intensity or time of your workouts, your body may be retaining water. If it has been over two weeks since your last weigh-in, the gain could be extra muscle. Use a measuring tape to see if you have lost any inches. Constipation can show a gain at the scale. Pre-Menstrual Syndrome has the symptom of water retention. If your cycle is about to start, you can attribute the extra weight to that. If you had a large loss the week before, it is normal to maintain your weight or even show a gain the next week. For these reasons, itâ€™s a good idea to check with your doctor before starting any weight loss program. In the end, the scale is merely a tool, and often not a very accurate one. If you follow your weight loss program faithfully, the scale will become an indicator or your success, not the final word on it. Sometimes I make time fly on the treadmill by changing the speed or incline every couple of minutes. Other times I want to finish a certain distance within the time that I have to exercise. The way that I have done this in the past is to use Microsoft Excel (a spreadsheet program) to calculate how fast for how long I would have to go to complete the distance that I want. Download this Treadmill Spreadsheet if you’d like to try it. There are a total of 9 workouts. All of them are 30 minutes long including a warm up and cool down of two minutes apiece. 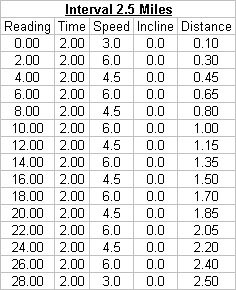 Since my treadmill starts the timer at zero and counts up, the â€œReadingâ€ column is what the treadmill should read when I change the incline or speed. I used these workouts when I was training for a 5K last year and I found them helpful. When I read Runnerâ€™s World, they would always talk about Interval workouts or Hill workouts, but they would never talk in specifics. They would say things like “Run at 70% of your 5K speed,” which really didnâ€™t help me. I wanted to know the specific MPH to set the treadmill to and when to change it. I ended up making my own treadmill workouts using this spreadsheet. You may be more of a beginner or more advanced than these workouts, but they could still be helpful to you. The formulas will still calculate the distance, if you change the speed. Play with it a little bit and you can make this work for you. I hope you find it as helpful as I have. I talked before how Pump It Up has a PC version of its game. I was going to buy that for my weight loss incentive in March (and I still might). I just found out that they are also releasing versions of the game for both Xbox and Playstation 2 in June 2005! Yippee! That makes me even happier now! Gametrailers.com â€“ Pump It Up Exceed: See the trailers that have been released for this game on this site. Mastiff Games â€“ Pump It Up Exceed: This is the official press release from the game publisher that is marketing the game for Andamiro. Go to their home page for the single screen shot they provided. GameSpot â€“ Pump It Up Exceed: Early review of the game including eleven screen shots. Got Next â€“ Pump It Up Exceed: Simple review of the game and those same eleven screen shots. This was just announced in mid-February, so they are really pushing to get these games on the market quickly. Not quick enough for me. I want it now! Nothing special happens when you complete workout number 35 on Yourself! Fitness. You donâ€™t open up any new workout environments or unlock any music. You donâ€™t get Platinum Status. As far as I know, there are no milestones after you unlock Gold Status. Yet, I still work out with Maya. This morning, she said, â€œIâ€™m proud of how consistent you have been.â€ She says something positive to me every time I make my commitment. Of course, when I havenâ€™t seen her for a few days, she gives me a loving lecture about consistency, but I know she will be happy with me if I stay on track for a few days. Maya is so much better than a real personal trainer. A real human being would get used to the fact that I usually show up every day for weeks on end and then go MIA (while I run on the treadmill or play DDR). A real human being would forget to give me positive feedback every single time I show up at a workout. A real human being would see when I donâ€™t do the exercises completely right and make me do them over. A real human being would ask me personal questions and try to be my friend. I donâ€™t need a friend. I need a workout partner who will be there for me whenever I want to exercise, even if itâ€™s three in the morning. Maya will do that for me and sheâ€™s chipper about it. â€œHey, did you know morning workouts are a great way to jumpstart your metabolism?â€ Of course, she canâ€™t hear me when I say, â€œI couldnâ€™t sleep and you were the only person I could talk to who I wouldnâ€™t wake up.â€ She would just start with the Step Touch and expect me to follow along. It also includes some information on how to spice up your treadmill workouts. If you are working out at the local recreation center, you may not be able to watch television while you run, but bringing along music or a book is a great way to help the time pass. It names companies that have been shown to take quotes out of context and misuse scientific data to promote their merchandise. Check out the article for the full story and think twice before using any of these products.